Architecture of most messaging systems is distinctive by the messaging server ("broker") in the middle. You can think of it as of classical "star" or "hub and spoke" architecture. Every application is connected to the central broker. No application is speaking directly to the other application. All the communication is passed through the broker. There are several advantages to this model. Firstly, applications don't have to have any idea about location of other applications. The only address they need is the network address of the broker. Broker then routes the messages to the right applications based on business criteria ("queue name", "routing key", "topic", "message properties" etc.) rather than on physical topology (IP addresses, host names). Secondly, message sender and message receiver lifetimes don't have to overlap. Sender application can push messages to the broker and terminate. The messages will be available for the receiver application any time later. Thirdly, broker model is to some extent resistant to the application failure. So, if the application is buggy and prone to failure, the messages that are already in the broker will be retained even if the application fails. Drawbacks of broker model are twofold: Firstly, it requires excessive amount of network communication. Secondly, the fact that all the messages have to be passed through the broker can result in broker turning out to be the bottleneck of the whole system. Broker box can be utilised to 100% while other boxes are under-utilised, even idle almost all the time. 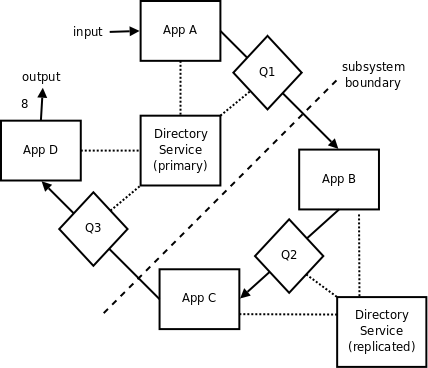 First, let's have a look how this scenario would look like when implemented using SOA (ESB, request/reply) architecture. 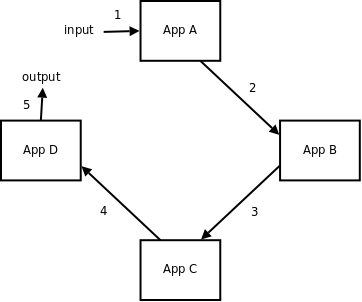 This architecture is based on RPC (remote procedure call) paradigm, where one application "calls" a function in a remote application. This is done by packing (marshalling) arguments of the function and sending them across the network to the other application, where the arguments are unpacked (unmarshalled) and the function is processed. Result is then packed and sent back to the calling application, which unpacks it and continues with processing. Even more importantly, broker has to process 6 messages (each message has to be passed in and out of the broker, thus 12 network hops) which is not much by itself, however, with high transaction rate (say 100,000 business transactions a second) the number of messages processed in the broker may hit the limit of the broker and/or hardware it is running on (600,000 messages a second). With a central broker architecture you cannot get more efficient than that. If the broker still acts like a bottleneck and/or latency is still too high, the only way to move forward is to eliminate the broker itself. As can be seen number of network hops decreased to three and there is no single bottleneck on the network. This kind of arrangement is ideal for applications with a need for low latency and/or high transaction rate. The trade-off is worsened manageability of the system. Each application has to connect to the applications it communicates with and thus it has to know the network address of each such application. While this is acceptable in the case as simple as our example, in real world enterprise environment with hundreds of interconnected applications managing the solution would quickly become a nightmare. Note that we can split the functionality of the broker into two separate parts. Firstly, broker has a repository of applications running on the network. It knows that application X runs on host Y and that messages intended for X should be sent to Y. It acts like a directory service. Secondly, broker does the message transfer itself. To solve the manageability issue we can leave the former functionality in the broker and shift the message transfer to be done by applications themselves. Thus, application X will register with the broker letting it know that it runs on box Y. Application Z wanting to send a message to application X will query the broker for the location of X. 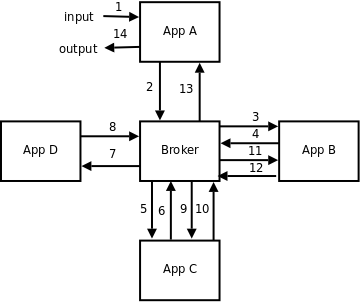 Once the broker replies that X is located on box Y, Z can create a connection directly to Y and send the message itself without bothering broker at all. This way we can get high performance and manageability at the same time. 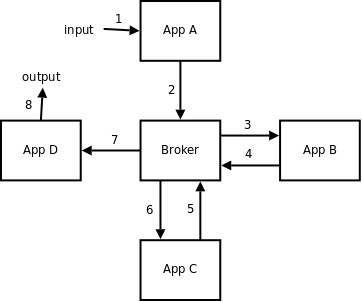 To get more details, ØMQ exchange example is an implementation of "broker as a directory service" architecture. However, in many cases there are few more problems to solve. As was already said, there are some advantages to the broker model, that are not available with the brokerless model. The sender application and the receiver application don't have to have overlapped lifetimes. The messages are stored in the broker while sender is already off and receiver has not yet started. Also, if the application fails, the messages that were already passed to the broker are not lost. To achieve this kind of behaviour you simply have to have some application (broker) in the middle. Consequently, you cannot avoid 2 network hops to get message from sender to the receiver, but still, it would be nice to avoid the "broker as a bottleneck" problem. As shown on the diagram, each message queue is implemented as a separate application. It may run on the same box as one of the applications it is connecting, it may be located on a completely different box. Several queues may run on a single box, the box may be dedicated exclusively to host a single queue. Queue is registered with the broker (directory service) and thus it is accessible to all the applications on the network. Moreover, the queue is very simple piece of software that's getting messages from senders and distributing them to the receivers. so the chance of failure is much lower than with real applications full of complex business logic. If you are interested in details, ØMQ chat example (see tutorial) is an implementation of "distributed broker" architecture. In some deployments it is imperative to avoid single point of failure. In other words, if one subsystem is destroyed or fails, other subsystems should continue working. While previous model is completely distributed message-wise, its configuration is still centralised in the directory service. If directory service fails or when it is unaccessible, system fails. To solve this problem we need a distributed directory service. Simplest example is a production line. 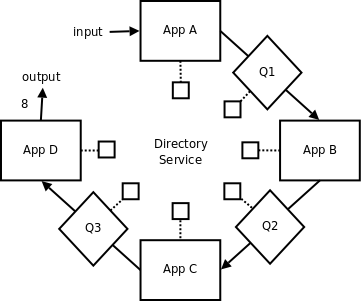 While it is developed developers can rely on centralised directory service. Single point of failure is not an issue during the development. Once the production line is deployed, we can copy the configuration to all the nodes of the network. The idea is that once deployed the network topology of production line will be completely stable and thus the issue of having to modify configuration on all the nodes is irrelevant. Still, many environments require both no single point of failure and dynamically configurable network topology. Think of a large bank. Failure of a single node (centralised directory service) shouldn't stop all the processing in the bank. Even if a branch office goes completely offline, processing in the office shouldn't stop. On the other hand, the networking topology in the bank is constantly evolving. New computers are bought, old ones are dumped. New software services are deployed, old ones are discarded. New network links are being established etc. While traditional messaging systems tend to use one of the models described above ("broker" model in most cases) ØMQ is more of a framework that allows you to use any of the models or even combine different models to get the optimal performance/functionality/reliability ratio. What about load balancing? e.g., there are 20-each of apps a, b, c, and d. One advantage of a broker is that it can farm out messages to the instance that is least busy. This is often accomplished using a simple round-robin approach where a recipient gets a new message for every message it is replied to, or something roughly similar to this. If there's a single source of tasks, it can load balance them directly, without a broker in the middle. If there are several sources of tasks (clients) and several workers a component in the middle is the best solution. We call those components 'devices' in 0MQ world. First of all, a nice article. I haven't read about 0MQ but must say I am tempted to give it a try. I always liked the idea of "no broker" achitecture as this is what we developed in my engineering college but in industry I have always worked with centralized broker based messaging middleware only. a. Can it be setup to find the other nodes from ZooKeeper server? b. How does 0MQ support the fault tolerance of the nodes? c. Is there any support within 0MQ for handling rejected messages and/or bad messages? I know the app/node can do this itself but then I am sure distributed brokers can be also be developed to achieve this. d. Is the message delivery guarantee / message ordering rely solely on the underlying protocol / dist broker data structure chosen or does 0MQ offers within API to achieve this? I'm researching messaging architectures and middleware for a project myself, so I'm by no means an experienced 0MQ developer, but ZooKeeper + 0MQ seems to be a very plausible architecture to supplement a 0MQ messaging layer with a fully developed configuration management/discovery service. I'm also considering using JGroups instead of ZooKeeper for that purpose, as a monolithic JGroups network for service discovery and administration is plausible for smaller deployments. Note that the above leaves the 0MQ and ZooKeeper/JGroups networks completely independent of each other. There is no need to shim 0MQ in as a transport-layer protocol for ZooKeeper or JGroups, just run both in parallel. The attraction of the approach described above is that you can largely avoid having to develop your own 0MQ broker device and control/administration network topology. With respect to your other questions..
b) It does not do this directly, other than to make it easy to create a fault tolerant topology. The argument for the 0MQ approach basically boils down to the fact that there is no universal definition of tolerance—it is application specific. Therefore it is better to make it easy to develop the specific type of tolerance required rather than attempt to make a universal but ultimately flawed and brittle tolerance system that is difficult to understand and test. c) No, for largely the same reasons as b.
d) Message ordering is guaranteed by 0MQ, but delivery is not guaranteed. Has the arrows inverted on 5 and 6. I'll fix it once I have some time free. You're busy for three years! You're busy for four years! And everyone else too! Martin is busy with nanomsg. 9 years and month(s) since last revisit. Great Article. I've used Tibco, IBM MQSeries, MSMQ, ActiveMQ, and am currently using RabbitMQ, but after looking at this I think I'll give 0MQ a go and see how it compares. What about management of the firewalls in a distributed architecture? With a central broker it takes away some of the complexity of specifying the openings one would need. Very good article indeed! Pragmatic, lean, and a clear vocabulary. Congratulations! 1)guarantees order of the messages at least from one sender to the other receiver. 2)Is is thread-safe, that means if my application is multi-threaded then do I have to explicitly make library thread-safe. 2)Does it supports synchronous events. 3)Does it supports persistence. Atleast is there a way where we can configure the property. 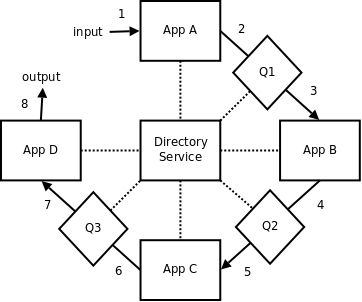 is there any example implementation of distributed directory service? Hi, I'm new to the idea of distributed systems, so please pardon if the question appears silly. In the first diagram I don't understand the existence of arrows #9 to #12. From the function pipeline, it'd appear that the processing finishes when App D is done. As per me, after #8, we have the output, which should take at most two more network hops. I suppose this has to do something with SOA architecture, but I'll be happy if someone could explain. Ankush notice in the pseudocode that each function returns the value of the inner function to the caller. That's what those arrows represent. We are popping a stack.